Job Edgar Lungu has assumed to summon one of the three leading international human rights organisations. 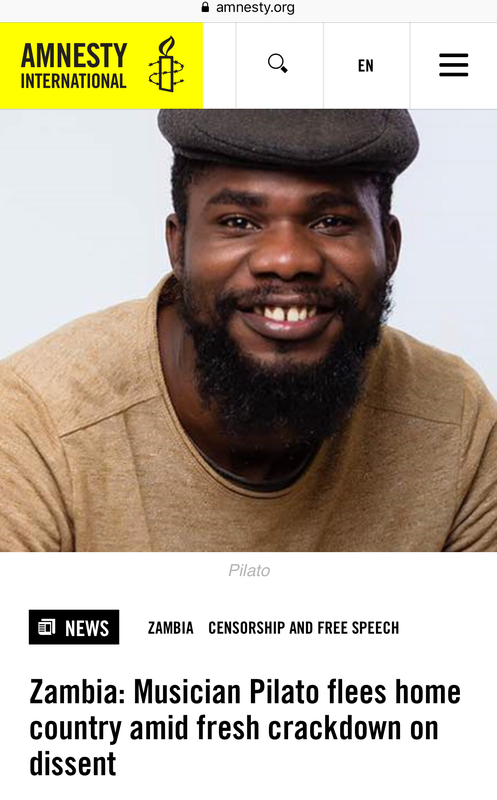 Through his high commissioner in South Africa, Emmanuel Mwamba, Lungu has summoned Amnesty International to explain to him why they issued a statement on the going into exile of influential artiste Fumba Chama, famously known as Pilato. Lungu wants Amnesty International to ‘discuss’ an alert the organization has issued on Zambian musician. A junior government official like Mwamba can not summon International organisations with authority from State House. So Mwamba is acting on behalf of Lungu. On behalf of Lungu, Mwamba contended that the alert issued by Amnesty International was alarming and did not reflect the correct status of Zambia on Human Rights. “Our country does not have any citizen that has fled into exile on account of threats on their lives because of what they said, wrote or sung about, its alien to us and unheard of,” Mwamba lied without shame. Even editors of this publication live in exile. He said that the Government of Zambia respects human rights especially those of its citizens. He said the rights and freedoms enjoyed by its people reflects the standing of the country as enshrined in its democratic constitution. “Watch the videos of Opposition leaders and the manner they describe both His Excellency President Edgar Lungu, members of his Cabinet or his government. Has anything happened to them?” He asked. Yes, a lot has happened. Hakainde Hichilema was jailed for more than 100 days for simply refusing to recognise Lungu as duly elected. Just yesterday, Chishimba Kambwili was at the police station while his supporters were been hacked by state sponsored thugs, others arrested. Saviour Chishimba was also arrested and Pilato himself has been arrested twice. He claimed that the open and free discussions that happen on Radio and television stations demonstrates that Zambians are enjoying freedom of expression and reflects government’s respect for freedom of expression and human rights. “ it is for this reason that we have called Amnesty International and Mr Fumba Chama for a meeting to discuss their concerns and fears” he said. “ There is no threat on the life of Pilato from government, from state organs, or from the ruling party. But I am aware and have listened to the so called threats that arose from voice-notes and a video on a social media platform -WhatsApp group. Pilato, many political and civic players are aware of the banter and nature of such discussion and verbal exchanges on social media”. So if he has already passed judgment, what does he want to discuss with Pilato? Mr Mwamba said a lot of other useless things which he does not even believe himself. But Amnesty is not YALI. Just wait and the drama that will unfold .